Want to know what's going on in Town Square this weekend? The Town Square transit pavilion, now serves as the hub for downtown transit. All routes from both Tigertrails Transit and the Capitol Area Transit System, that go through downtown are now making pick-up and drop offs from this location. 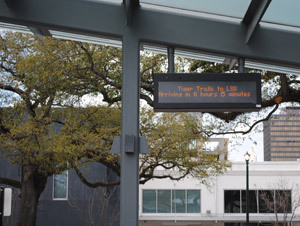 Live transit information makes it easy for pedestrians to navigate when buses will be arriving and leaving, while the area provides a variety of activities to entertain visitors while they wait.